Photo: Hayemaker Ringstar — Joe Joyce maintained his undefeated record with a first round knockout of late replacement Ivica Bacurin last night at London’s home of boxing The York Hall, Bethnal Green, promoted by Hayemaker Ringstar. In front of a packed house with an electric atmosphere, Joyce, the Commonwealth Champion, made it his third first round stoppage as he halted Croatia’s Bacurin at just 1:54 of the opening round. Bacurin had taken British heavyweights Dillian Whyte to six rounds and Tony Bellew to ten rounds on his previous visits to these shores, but he was up against the imposing presence of the 6ft 6in ‘Juggernaught” and quickly realised he was out of his depth. From the opening bell Bacurin went on the back foot, with Joyce moving well and getting his distance right with his heavy jab. Joyce looked very relaxed as he utilised improved head and body movement and cutting the ring off with some great footwork. A solid right hand from Joyce hurt Bacurin as he was going back towards the ropes and then moments later Joyce landed a left hook to the top of Bacurin’s head that dropped him. With Jeff Hinds waving it off, Joyce celebrated his victory and showed off his amazing athletic agility for his 17st 13lb frame with his trademark capoeira flip. Rivals and potential next opponents Hughie Fury, the newly crowned British Champion, and Derek Chisora were both at York Hall, witnessing the power of ‘The Juggernaut’ from ringside as Joyce took his record to 5-0. Keen to keep fighting regularly, he now looks at who will be willing to step in the ring with him next despite establishing himself as one of the most avoided heavyweight in the division. An action packed card saw Hayemaker Ringstar’s exciting young talents all in action and continuing to develop into top prospects. Bellator (MMA) super-star star Michael “Venom” Page demolished Michael Ciash 18 seconds into the second round with Ciash unable to deal with MVP’s unorthodox style and power, his boxing record moves to 2-0. 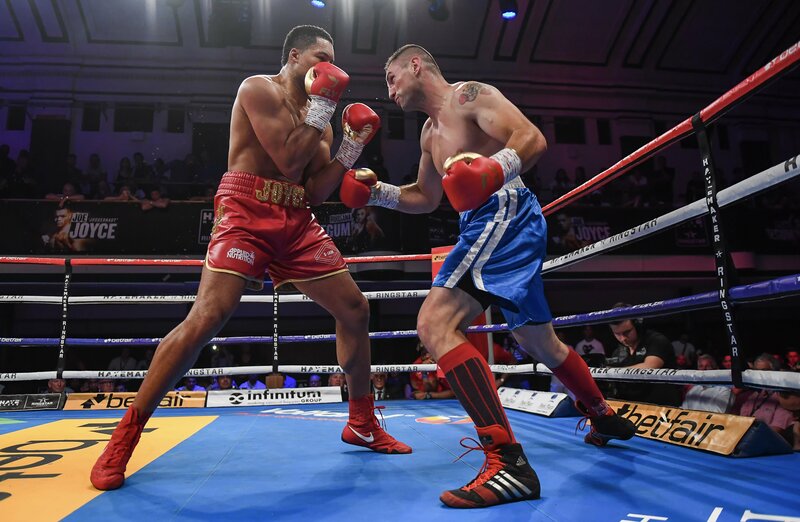 Welsh super-middleweight ace Kody Davies had a bright start against Eric Mokonzo and floored him the second round, but Mokonzo fought back and pushed Davies to the end of an entertaining fight. Davies won 40-37 on points and took his record to 5-0. The chief supporting contest saw history being made as the first ever women’s Commonwealth title fight in the UK between Sam Smith and Anisha Basheel for the Vacant Lightweight Championship. Hard-hitting Basheel stopped Smith at 1:08 of the first round to claim the title. All featuring on the undercard was Britain’s first ever female World Amateur Champion and double Olympian Savannah Marshall who celebrated her second second round stoppage in a row when she halted brave Mexican Alejandra Ayala at super-middleweight. Top unbeaten middleweight prospect Linus Udofia and the most recent signing for Hayemaker Ringstar was involved in a terrific all-action contest against Eric Nwanko with a possibility of an upset in the opening round with Udofia hurt. Udofia came back and stepped up the pace making Nwanko take a knee in the third. In the fifth Udofia landed and a cracking combination to floor Nwanko and end the fight. Watched at ringside by Chisora, heavyweight debutant George Fox – son of top London trainer Don Charles – opened his professional career with a 40-37 points win over fellow debutant Phil Williams. Completing the card, featherweight Fuad Huseen won 40-36 against Edward Bjorklund; super-middleweight Chris Davies won 40-37 against Callum Ice; super-featherweight Brandon Ball won 40-37 against Luke Fash; lastly welterweight Tom Ansall won 40-35 against Fonz Alexander.